Questioning whether he might be a racist, Biden said he had asked "the blacks on my staff" whether he harbored something "in me that’s deep-seated that I don’t know." 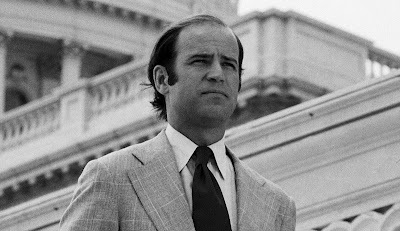 Biden's comments were made in an NPR interview discovered in congressional archives by the Washington Examiner. They underline the perils of Biden, 76, mounting a 2020 campaign after a career spanning 36 years in the Senate and eight years as vice president, during which he gained a reputation for being rambling and verbose. Biden's Senate career began in 1973 when he was 30, the youngest age allowed by the Constitution. It was a different era. All 100 senators were men and the sole black senator, Edward Brooke, was a Republican. If Biden opts to run, he will face an African-American woman, Sen. Kamala Harris of California, and a Samoan-American woman, Rep. Tulsi Gabbard of Hawaii, as well as perhaps two black men, Sen. Cory Booker of New Jersey and former Attorney General Eric Holder, and three white women, Sens. Elizabeth Warren of Massachusetts, Kirsten Gillibrand of New York, and Amy Klobuchar of Minnesota. Biden's conclusion on busing, according to his own account, was not arrived at lightly. He claimed he spent “close to 300 hours” studying the issue before staking out a position against it. He said he met with black members of his staff and asked if they thought he harbored hidden racial prejudices. "I give you my word as a Biden, I put in over 100 hours, by far — I would say close to 300 hours — on just torturing this [anti-busing concept]. Calling my staff together, and the blacks on my staff together, saying ‘Look, this is what I think. Do you think I am [racist]? Is there something in me that’s deep-seated that I don’t know?'" Brooke was bemused by Biden's stance, saying, "I don’t think it’s a new liberalism to say that, you know, you can’t support busing." He added: "Actually, more than 40 percent ride buses to school every day. If it is used, he’s not against it for consolidation of schools, obviously he’s against it for the desegregation of schools." African-Americans comprised 14.3 percent of the population of Delaware in 1970, according to U.S. Census Bureau data — less than two-thirds what it is today. White voters in the state, on whom Biden's re-election in 1978 depended, overwhelmingly opposed busing. Gary Orfield, a University of California, Los Angeles, political scientist and author of the 1978 book Must We Bus: Segregated Schools and National Policy, told the Washington Examiner that Biden’s comments about "black pride" and African-Americans wanting their "own identity" were common arguments against desegregation at the time. “This is one of the traditional conservative ways to oppose integration," said Orfield. “All of the surveys of African-Americans show virtually no preference for segregation. ... They favor integration," he said. “We did polls at the time and surveys, and 90 percent or so of suburban parents strongly opposed to sending kids over city-county lines in so-called ‘busing,’” said Raffel. "There was a tremendous amount of upset and negativity and opposition to it. … The threat was always there that anybody, including Biden, could be defeated by that opposition."